(CNN) - Accused Arizona gunman Jared Lee Loughner was not registered to any political party, and in fact hand wrote "independent" on two separate voter forms, county officials said Monday. Pima County, Arizona, Registrar of Voters Chris Roads said Loughner registered to vote on September 26, 2006. Voters are not required to list a political party, but are instructed to write at least the first three letters of any party they want to be affiliated with. The state of Arizona recognizes dozens of affiliations. 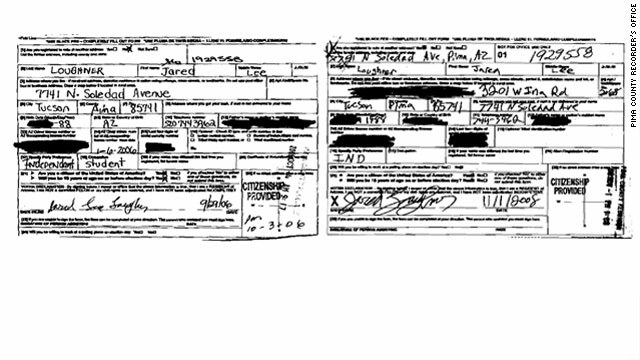 Records obtained by CNN show Loughner chose to write IND on one form, and independent (misspelled) on the second form. Roads said Loughner voted in the general elections in 2006 and 2008, but did not vote in 2010. The county lists his voter status as inactive after mail sent to his address was twice returned as undeliverable. Does this piece of out dated evidence suggest that the rhetoric of the republicans and tea party (established post this document) had no influence on the gunman? Wow! The literary genius made a spelling error! Or maybe the rest of us got it wrong because of mind control. Voters are not required to list a political party, but are instructed to write at least the first three letters of any party they want to be affiliated with. Required? Not true. When I registered to vote 4 years ago I left the political party box blank. The fact that this guy had no party affiliation is irrelevant. I do think he was your workaday nutjob who happened to find encouragement or motivation in sources we may never know. The big story here is that 9 people were senseless murdered by someone who probably would not have been prevented. If he didn't buy the gun, he would have stolen it. As his own blogs show, he has been planning this for some time. The ensuing discussion about the toxicity of politics today is nonetheless a good one to have. I don't think it is appropriate for any politician to use symbols of violence to demonstrate his or her political point or ideology. Although I think that the prevalence of Fox news, Glenn Beck and all the rest has inspired a lot of the anger and vitriol in this country, this behavior is by no means exclusive. I did not hear Obermann yesterday (I don't normally listen to him anyway) but was just sickened to hear the bits of Limbaugh's broadcast that I could stand. It's his job, I know; but he is about as repugnant a human being as they come and you'd think, you'd think, that just for one day he could tone it down.
. The ensuing discussion about the toxicity of politics today is nonetheless a good one to have. You don't have to be a member of a political party to not get caught up on the hate and second amendment remedies (angle) and we need to start a revolution (bachman on the steps of our Capitol!) or crosshair maps that have been up for months or radio and TV haters telling us how those who don't agree with us are evil and nazis and socialists!! All you need is one individual mentally unstable to get it into their heads that the only solution is to go out and kill those who don't agree with us or have "done us wrong". Olberman might be a little bit off but I have never heard him call for anyone to go out and kill we leave that to faux news and their minions. I don't care what party affiliation this guy has, what he did was morally incomprehensible. His family must be ashamed. You've established an interesting precedent – the implication being that those of a similar voting pattern all become "accessories to murder". while you're at it, you want to look up the registrations for the Ft. Hood shooter, the Discovery Channel hostage taker, and the Unabomber? How about serial murderers? How about obtaining his religious affiliation or tax records. That would create some interesting talking points about how anyone of the same religion or income, chariable giving, etc. should probably be watched. So will the NY Times, the Washington Post and other MSM outlets be writing retractions that they published articles pointing fingers erroneously before gathering the facts and that the tragic shootings were the act of a insane person and were not a politically motivated rampage.? Why let facts get in the way of more angry rhetoric? Why not publish hateful articles with no factual data accusing other people of being hateful and inciting violence. Are journalists still required to have ethics? Where were the journalists when a movie came out about the assassination of GWB and a how to book for assassinating GWB? But I guess that is ok and gets a free pass when its your side slinging the hate. The Constitution should be amended. No civilian, under any circumstamces should be able to own deadly weapons. Drug dealing is punished so harshly (automatically) – the same should apply for catching somebody possessing firearms. Crminals would probably still get their hands on guns, but ordinary people wouldn't be playing around with them. Guns are too easy to get, are too easy to use to kill people (the suspect in the Arizona massacre would not have gone too far with a knife!!). The assassins of our public figures are rarely members of a party or group that explicitly benefits from the shooting. They are typically loners who do not readily join organizations nor do they even have a well thought out political position. They do surface, however, during times of angry divisiveness when the media is full of extreme statements. The public anger gives them the blessing to execute their own private vengeance - one that has meaning only in the warped mind of that individual. The call to "tone down the rhetoric" is to deny the wackos the fuel. No one expects that this shooter was acting on explicit instructions from anyone but the rhetoric was feeding the beast. You can disagree and propose alternate theories and argue that yours is better but none of this requires us to insult each other, disrespect each other (Libertards and Repuglias), tie the other side to hated groups (Nazis, Jihadists), or create lies. No political affiliation? Who did he shoot and who did he vote for? Many tea party supporters might call themselves indepenndent, but how many of them vote for democratic or left leaning candidates? How many left wing politicians put cross hairs on political districts, and how many preach about reloading and citizen revolts as a way to justify attempted murder or murder? Not jumping to conclusions is one thing but this hateful rhetoric paints the picture by itself, all we have to do is look at the picture. How do we prepare ourselves for something so tradgec? Prayers go out to all the lives lost and to the congress woman. So what, I am an independent. I registered as an independent because I wanted the right to vote is whichever primary election I want to vote in, not the one of a specific party. This notion that this guy was driven, if only through verbal directive, by people like Beck, Limbaugh, Palin, O'Reilly and members of the House and Senate who used words like, illiterate and illegal immigrants, treason, socialist, along with phrases such as "Selling out of America" and "Government Death Committees" for the new healthcare bill, has merit. When you have someone who is unstable, and you pound the person with hate messages 24/7, you are pouring gasoline on a burning fire. Where did he get the money to purchase a Glock-19? Why did he purchase extension clips for 31 rounds of ammunition? Why did he go to Walmart to buy boxes of ammunition, and not the store where he purchased the gun? Why did he target a Democrat Congresswoman? You are going to find out that his father helped stoke the fire of hatred in this guy. Now go find out what his father was thinking and saying everyday. Awesome, now that they got the important stuff out of the way, they can convict him. This goes to show once again that some small town single, young WHITE male goes off on killing spree,"in the name of some Voice in his head told him to do so. Now here come the gun lobbiest with there increase the gun laws. WAKE UP CALL. This will not do any good for a criminal who does follow the laws of the land any way. Those poor people have my deepest prayers. Yes, that's the point. The Tea Party catered to Independent voters! It really was disgusting to see the left trying to make political hay out of this event. How many more times have they got to be wrong before they can wait and see what the evidence shows? The fact that people are even trying to tie him to a certain political party, and the fact that people are even concerned about what political party he associates himself with is sickening. Is THAT what the state of our politics is? Which party to blame for a senseless act of violence? That's a shame. His declared political leaning means very little... I'm a registered Republican who voted for Congresswoman Giffords. Why is his handwriting and signature so different on each form? As an adult, your handwriting doesn't change that much in a two-year span. The spin will continue though. Some will claim Independents are the Tea Party. And others will claim that his claim to be Independent underscores is loner mentality. Bottom line is that he is a a free agent to be pinned onto any group or movement that is being spun as undesirable. Funny how its so important to discredit the guy. Dont ask what he was thinking lets use our powers to read his mind and tell everyone. Typical of our country. We bash everyone and don't really try to solve problems. We hide them. It is obvious that no political affiliation is the cause of his heinous actions. but public personas need to realize that disturbed individuals will latch on to irresponsible rhetoric and publications of violent verbage. Also notable, the shooter's friends stated the abused substances on a daily basis. They mentioned pot and the shooter also almost dying from ETOH poisoning...at, or close by the H.S.during school hrs. From my exp. as a nurse, ppl admit to less than what they ACTUALLY consume. What else was the shooter using for yrs and how much did yrs of substance abuse contribute to his paranoia?